I had already written in the past, that I like to combine new technologies to build new solutions. There are new technologies coming which might get not that attention yet they would deserve. My recent attention got caught by Power BI. I had some sort of idea what Power BI would be but not in detail so I did some research to get a better picture. My intension is to give you a brief idea what Power BI for Office 365 and Power BI is, because I will do some future blog posts on Power BI and will refer to this post. Power BI for Office 365 will not be my focus, because it is somewhat “old” and too tight up. Microsoft Power BI is a collection of online services and features that enables you to find and visualize data, share discoveries, and collaborate in intuitive new ways. There are two experiences now available for Power BI: the current experience, generally referred to as Power BI for Office 365, and a new experience for Power BI, currently offered as a public preview. So there are TWO Power BI thingies out there. The Power BI for Office 365 version is the older and probably more known version of the Power BI family, than the new Power BI version which currently is in a preview version available. So what are the main differences? This version is a kind of available for Office 365 customers and is online integrated into Office 365. The technology is based on Excel 2013 Power View / Power Pivot and SharePoint 2013 Excel Services. You probably could name it the “big online brother” from your local Excel 2013 Power View / Power Pivot / Power Query couple. It pulls the data, caches it and loads the needed tables into memory for analyzing it. To get the data in to Power BI for Office 365 there are more or less traditional data source provider available like SQL Server, Excel files, CSV, Oracle and others. What is Power BI for Office 365? Power BI for Office 365 is a cloud-based service that works with Excel to provide a complete self-service business intelligence (BI) solution. With both Excel and Power BI for Office 365, you can give everyone in your organization a powerful new way to work with data. 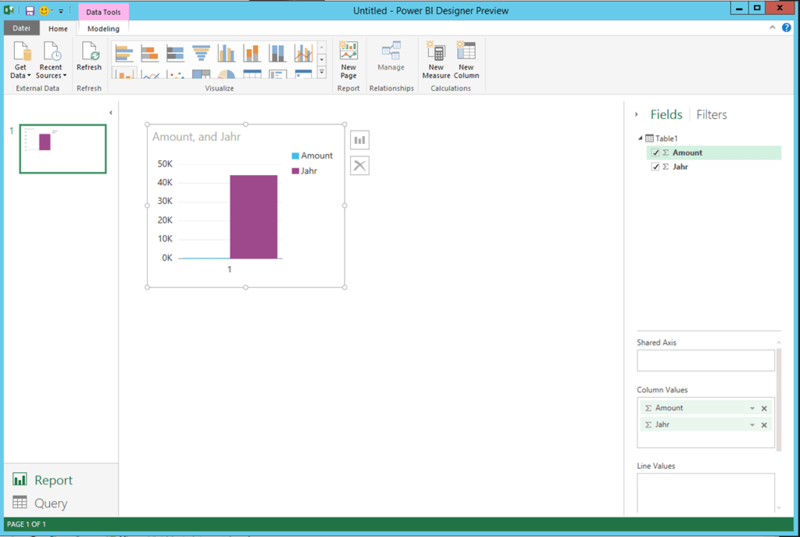 In Excel, you can now discover, analyze, and visualize data like never before to find valuable business insights. With Power BI for Office 365 you can easily deploy a cloud-based BI environment for users to share insights, collaborate and access reports, from anywhere on any device. 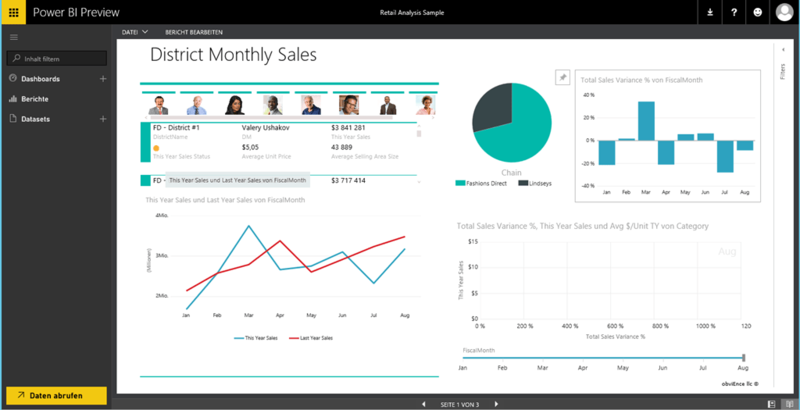 Power BI (Preview), is another and a different thing than Power BI for Office 365. As the name implies it is currently in a preview phase, but will be soon (GA on July 24th). The new Power BI is available at PowerBI.com. It is also an online service, which is used for analyzing data and displaying this data in modern and appealing dashboards / reports. The Power BI service is a “standalone” service, meaning there is no dependency on Office 365 or anything else. You have 3 elements dashboards, reports and datasets. A a dataset is the source of your dashboards and reports, so speaking something you can connect to. This source can be an Excel workbook, a database or many other data (sources). See the list of dataset types that can be used with Power BI. can be used in many different reports. Visualizations from that one dataset can display on many different dashboards. A dashboard is something you create or something a coworker creates and shares with you. It is a single canvas that contains one or more tiles. Each tile displays a single visualization that was created from the data in the underlying dataset(s). 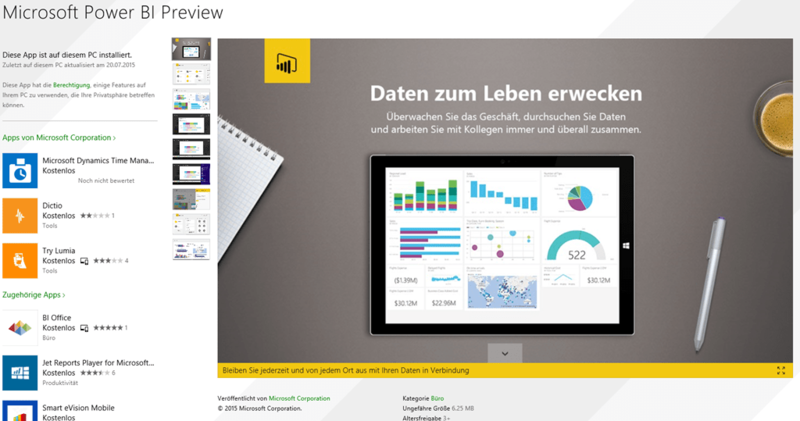 A Power BI report is one or more pages of visualizations (charts and graphs). Reports can be created from scratch within Power BI or can be imported with datasets and with shared dashboards. This doesn’t mean that you can create a Power BI report outside of Power BI. What it means is that Power BI takes a look at data you’re connecting to and, if it can, creates a report based on some or all of the data. can be associated with multiple dashboards (tiles pinned from that one report can appear on multiple dashboards). As we have now a brief understanding what Power BI is, we need to see what other parts there are. Authoring reports and dashboards can be done either online or through a client tool Power BI Designer. The dashboards can be viewed bascially through any browser enabled device. In addition there is already an iOS Phone App, Windows Phone and Android apps will follow. For your Windows 8.1+ you can install the Windows App from the Store. Finally there is also an API which REST based and uses JSON to upload data and interact with the service. One of the very cool feature is the REST API which is using JSON to create datasets and upload data. The API is not complete yet e.g. so far you are not able to delete datasets, but we can see that Microsoft offers us an interface to interact with this service. The pricing of Power BI is in my opinion a fair deal and for trying it out you have a free option which is limited in capacity and amount of data. Power BI vs. Power BI Preview: What’s the Difference? I will blog on some upcoming posts about Power BI, which will be GA on July 24th. I can see in this technology a very high potential in combination with other products and services. As you might have seen the Power BI is not full featured yet and what I have experienced yet, not very responsive and reliable BUT keep in mind it is just a preview and Microsoft is working hard to provide the best service. 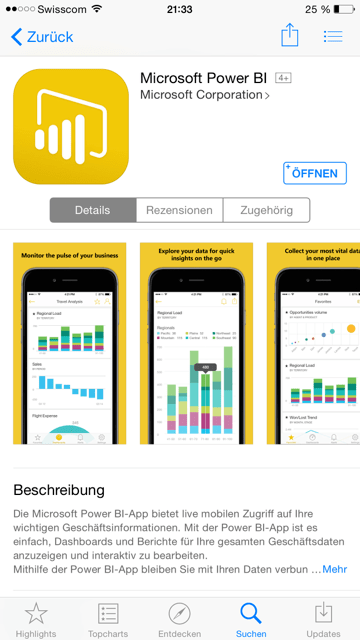 Update 23.07.2015: I have written this post few days ago, and in the meantime, Microsoft already updated the Power BI service, and appears now with a better interface and seems to be more reliable and responsive. I hope you got an idea and I promise the upcoming posts are really really cool!